Ryder Cup: Can dolphins teach golfers how to win? 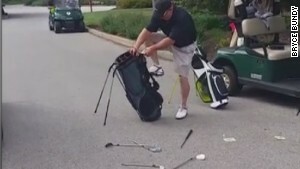 (CNN) -- What can a pod of dolphins teach golfers? Quite a lot according to Paul Azinger, the last man to captain the United States to victory in the Ryder Cup, back in 2008. Another humbling at the hands of Europe, who completed a third straight victory in the biennial team tussle at Gleneagles last month, provoked a familiar wave of American introspection. Surprisingly, it was sparked by one of its own team members -- five-time major winner Phil Mickelson -- who launched an astonishing critique of the job done by 2014 skipper Tom Watson. The 44-year-old lauded Azinger's leadership during the 2008 tournament at a tense press conference at Gleneagles, hours after Europe's 16½-11½ success had been confirmed. 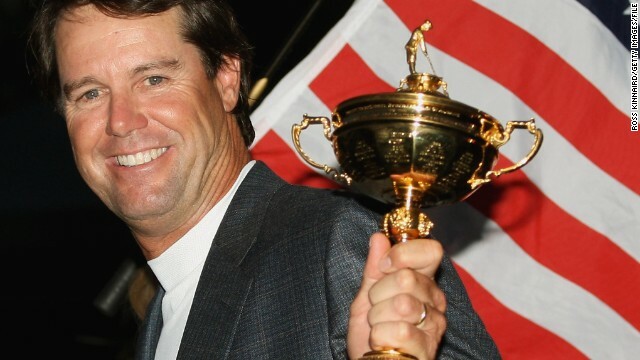 The clamor is growing for Paul Azinger to be Ryder Cup captain for the United States in 2016 after it suffered a third straight defeat to Europe. The 54-year-old was the last man to lead America to success in the biennial team competition, in 2008. It remains their only success this century. The calls were led by Phil Mickleson, who lauded Azinger's captaincy during the United States' press conference in the aftermath of its 16½-11½ defeat to Europe at Gleneagles in Scotland. 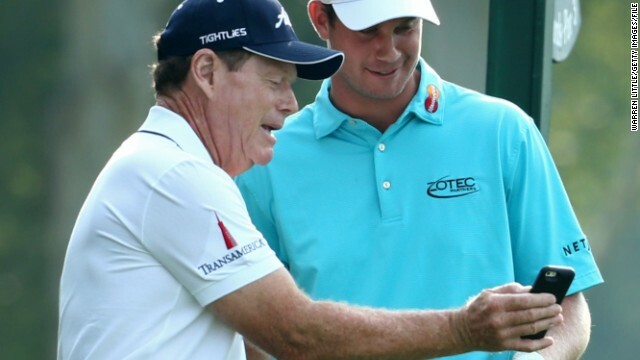 It was taken as tacit criticism of 2014 captain Tom Watson. Mickelson said Azinger had involved the players in his decision making process and formulated a "real game plan," the implication being that Watson had done neither during his tenure. In reply to Mickleson's comments, Watson said: "(Phil) has a difference of opinion. That's OK. My management philosophy is different than his. I had a different philosophy than Paul. I decided not to go that way." Azinger created four-man pods among his 12 players in 2008, allowing them ownership of the process. He also enlisted business principles to match them by personality types. 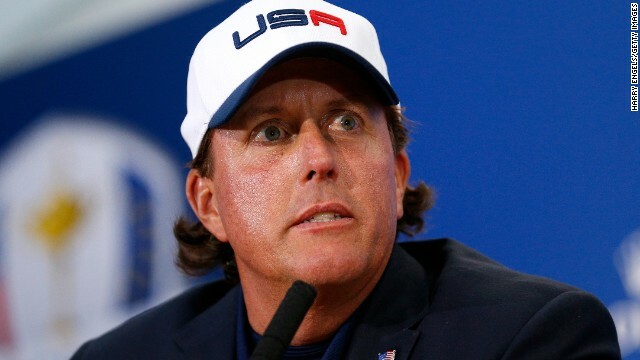 "We have strayed from a winning formula in 2008 for the last three Ryder Cups, and we need to consider maybe getting back to that formula that helped us play our best," Mickelson added. 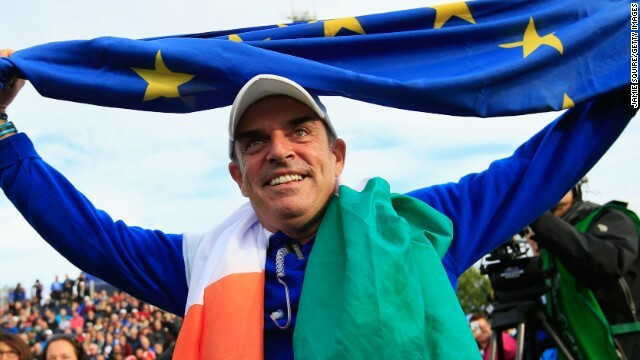 There was no such fall-out on the European side, with captain Paul McGinley's players lining up to praise the fun atmosphere he created, his motivational techniques and meticulous attention to detail. The 64-year-old veteran, who was the last man to secure a U.S. triumph on European soil in 1993, sat listening to Mickelson's monologue with a painted smile on his face. He then replied: "(Phil) has a difference of opinion. That's OK. My management philosophy is different than his. I had a different philosophy than Paul. I decided not to go that way." Prior to the 40th installment of the competition in Scotland, CNN spoke to Azinger, who laid out the principles he felt were instrumental in sealing what is still America's only triumph this century. One of the fundamental aspects of his captaincy centered around a pod system, relating to the way dolphins coexist with one another, where the 12 players are split into three teams of four. 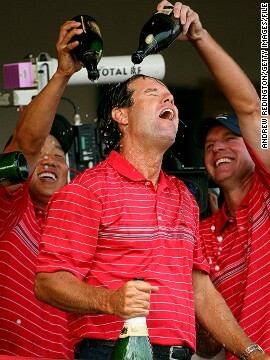 "I tried to get my players invested and engaged in the process early," Azinger told CNN's Living Golf show. "Then I gave ownership of their little small man groups and empowered them by allowing them to pick who filled out their team. These guys bonded and we were bonded as a team with a secret. "That's what we built prior to the matches and prior to showing up at Valhalla." In it he details how the "code" was concerned with team building and applying business principles to the Ryder Cup formula. It also embraced the Myers-Briggs test -- used by government agencies, colleges and HR departments -- to group people together based on their personality traits. "The code was through observation," he explained. "I see what Europe has in place; the Spaniards play together, the Irishmen, the Englishmen. "If there's crossover you'll get best friends like an Irishman in Darren Clarke and an Englishman like Lee Westwood, so there's small groups already in place. "I'm using their personality types to put the players in groups through observation about who they are, breaking everybody into four personality types. It was really a leadership philosophy to team building that's the code. 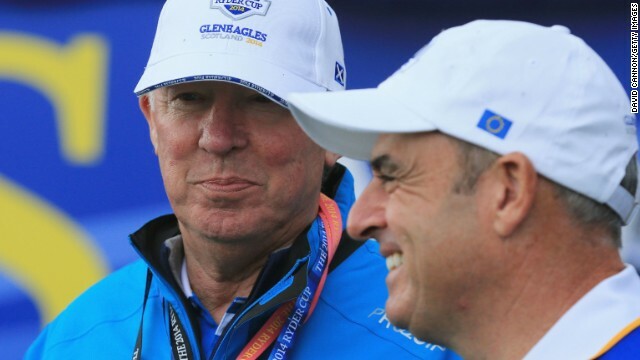 El capitán europeo Paul McGinley recurrió al antiguo entrenador del Manchester United Alex Ferguson, el hombre que lo sabe todo cuando se trata de ganar, para darle a su equipo una charla motivacional antes de la Ryder Cup en Gleneagles. 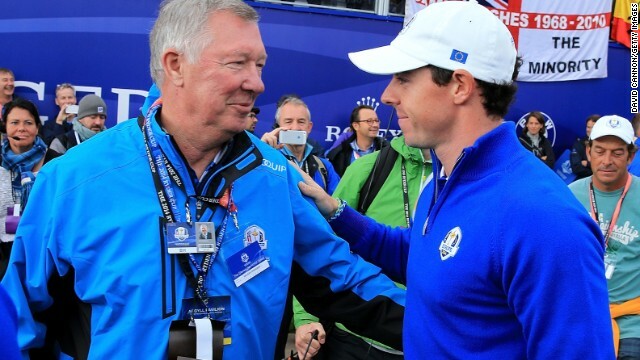 "Estaba como en una especie de trance mientras escuchaba todo lo que decía", dijo Rory McIlroy acerca de las palabras inspiradoras de Ferguson. Aunque Ferguson fue una fuente de inspiración, uno de los objetivos de McGinley era relajar a sus jugadores tanto como fuera posible. Justo al lado de la puerta de salida en el vestuario del equipo europeo, el capitán colocó estratégicamente una frase de Bob Torrance, el difunto padre del vicecapitán Sam, la cual decía: "Los días más felices de nuestras vidas". Ningún evento deportivo sería lo mismo sin un ambiente electrizante, por lo que más de 40.000 fanáticos llenaron el campo de Gleneagles todos los días. "El público escocés, la gente de aquí fue fenomenal", dijo Phil Mickelson. "Siempre fueron muy amables y respetuosos con todos". McGinley y Tom Watson, capitán del equipo estadounidense, escogieron a tres jugadores para sus respectivos equipos, por lo que tuvieron una influencia directa del 25% sobre el equipo. Las elecciones de McGinley rindieron mejores resultados que las de Watson, especialmente por Jamie Donaldson, y quien formó parte del valioso dúo con Lee Westwood. Juntos ganaron dos de los tres partidos jugados. Mickelson fue poco discreto en cuanto a sus críticas en contra de deficiente "plan de juego" de Watson. Los comentarios de Mickelson en contra de su capitán evidenciaron la falta de armonía que había en el equipo de los perdedores. The victorious European team and captain Paul McGinley after retaining the Ryder Cup at Gleneagles. 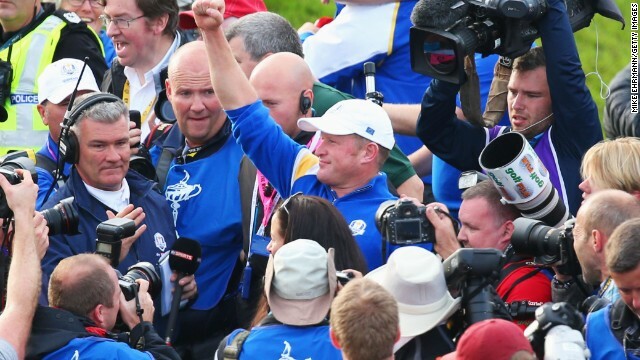 Jamie Donaldson is surrounded by fans and the media after clinching the Ryder Cup for Europe with a win over Keegan Bradley. Graeme McDowell trailed U.S. rookie Jordan Spieth early in their singles match but he hit back for a pivotal victory. 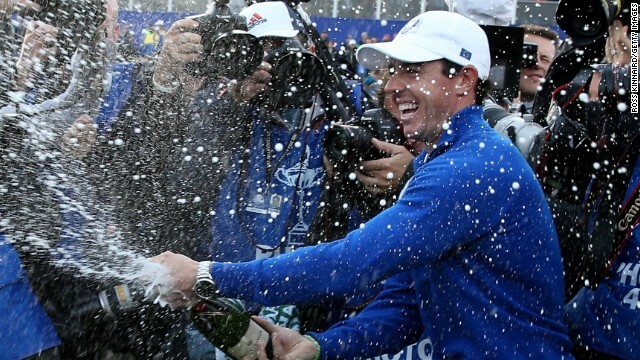 World number one Rory McIlroy led from the front with a 5&4 victory over fellow young gun Rickie Fowler. Europe's winning captain Paul McGinley soaks up the atmosphere after his side clinched a 16 1/2 to 11 1/2 victory at Gleneagles. 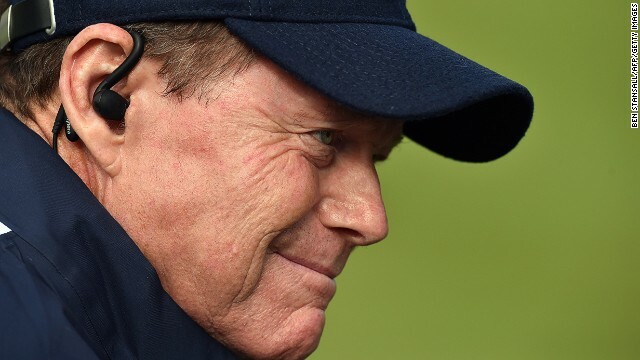 U.S. captain Tom Watson cuts a rather forlorn figure as his team slips to defeat in the 40th Ryder Cup at Gleneagles. 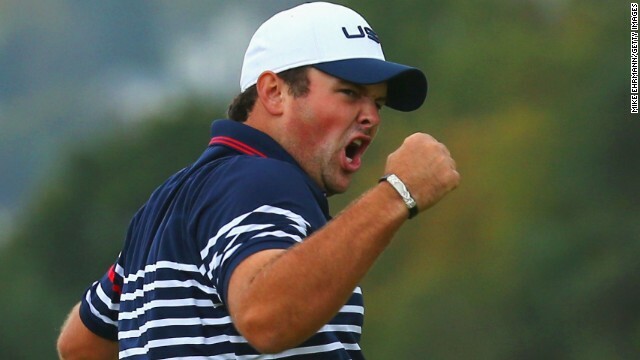 The performances of rookie Patrick Reed have been a rare bright spot for the U.S. and he beat Henrik Stenson on the last day. Phil Mickelson beat Stephen Gallacher in his final day singles but cuts a dejected figure as he sits alongside his wife Amy. 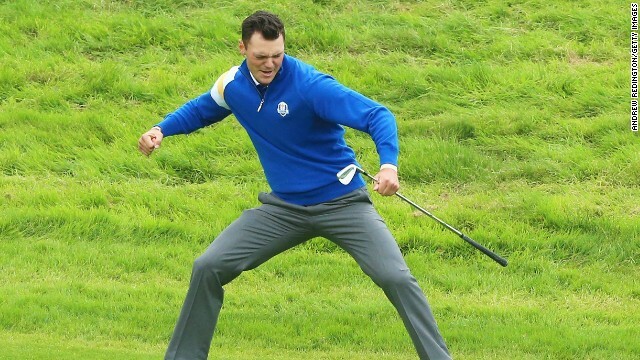 Martin Kaymer holed the winning putt in the 2012 Ryder Cup at Medinah and his chip in from off the green 16th proved equally memorable as he beat Bubba Watson. Europe's Rory McIlroy (right) and Ian Poulter claimed a vital half point against Jimmy Walker and Rickie Fowler in the morning fourballs on Saturday. 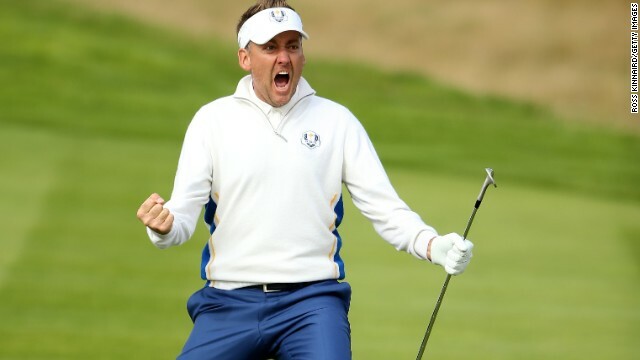 Ian Poulter is known as Europe's postman, because he always delivers. Here he celebrates some first-class chipping, holing out at the 15th in the morning fourballs. 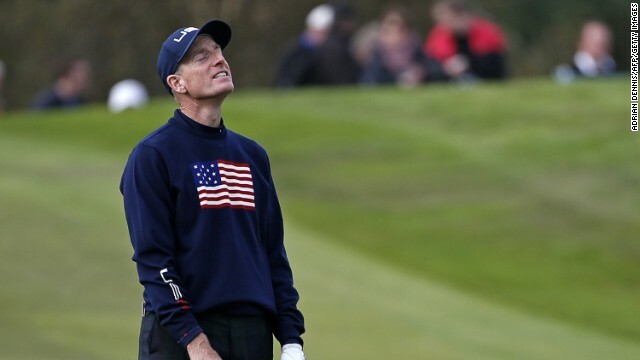 Jim Furyk curses his luck on day two at Gleneagles. The veteran American, who is playing in his ninth Ryder Cup, won his morning fourball with partner Hunter Mahan, but the pair lost out to Sergio Garcia and Rory McIlroy in the afternoon foursomes. 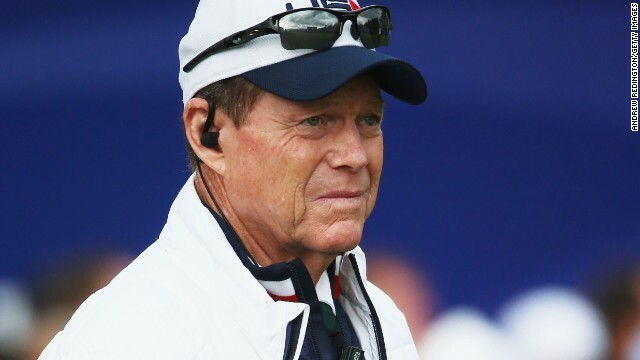 Tom Watson's demeanour rarely changes, but the U.S. captain must be concerned that the 10-6 deficit may be too much for his team to overhaul in Sunday's singles. 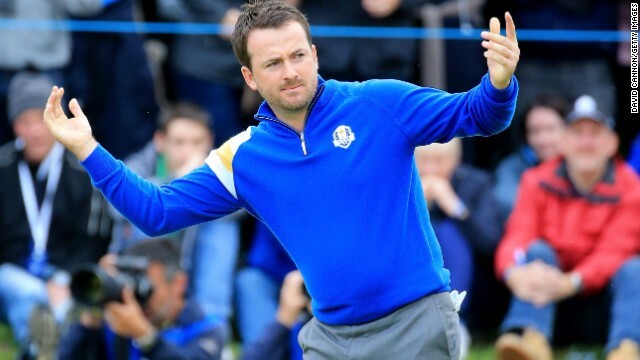 Europe need just four points from a possible 12 on offer to retain the Ryder Cup. 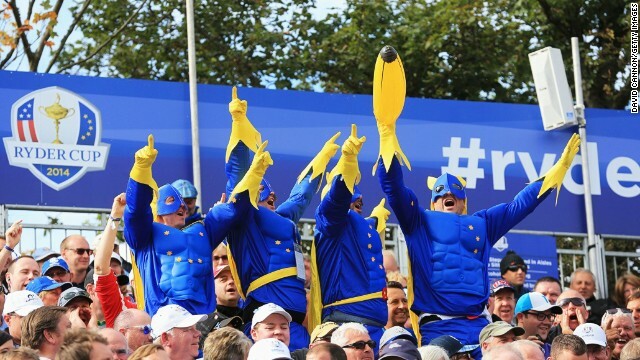 Spectators dressed as bananaman enjoying day two in the grandstands at Gleneagles. Nice pants! 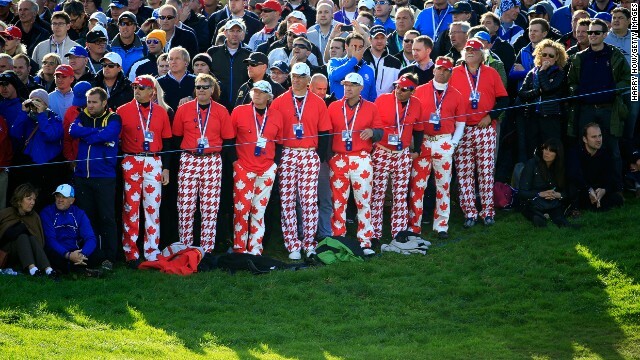 There's always plenty of colorful clothing on show at the Ryder Cup. 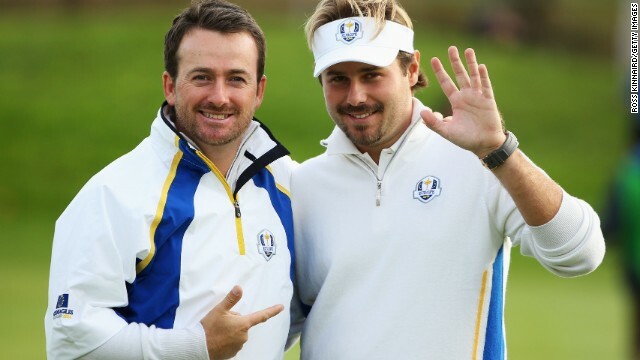 Rookie Victor Dubuisson and Graeme McDowell were once again on song for Europe in the afternoon fourballs beating Jimmy Walker and Rickie Fowler 5&4. Player of the tournament? 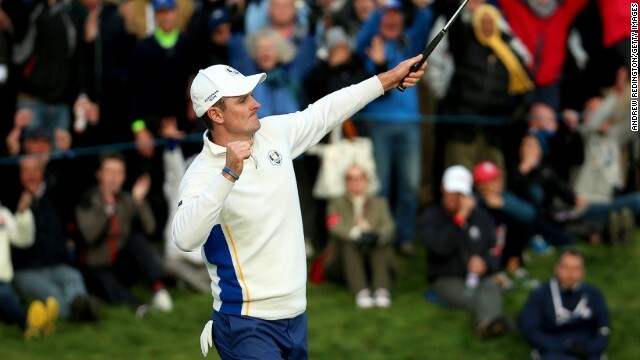 England's Justin Rose has secured 3½ points in four matches for Europe so far. In the morning fourballs, he teamed up again with Henrik Stenson to beat Bubba Watson and Matt Kuchar 3&2. In the afternoon foursomes he claimed a vital ½ point with Germany's Martin Kaymer against Jordan Spieth and Patrick Reed. 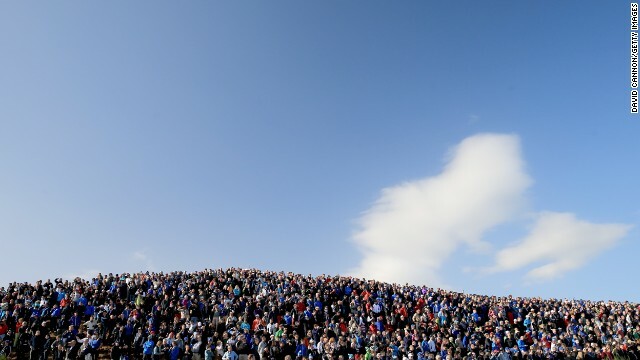 Webb Simpson and Bubba Watson (left) got Team USA's challenge underway on Friday morning in front of crowds massed around the first tee at Gleneagles. 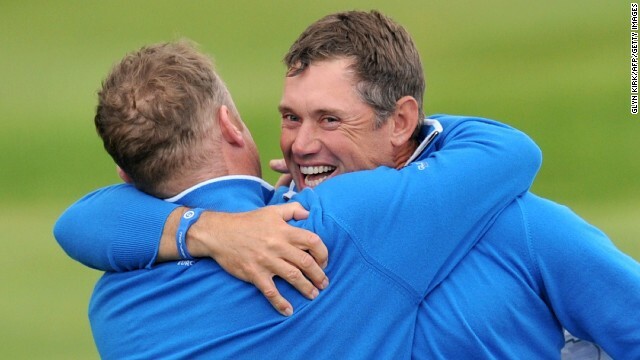 Watson and Simpson were no match for European pairing of England's Justin Rose (left) and Swede Henrik Stenson. The experienced duo won the match comfortably 5&4 to give Europe the first point of the match. The pair ended up taking maximum points on Friday with a 2&1 win over Hunter Mahan and Zach Johnson in the afternoon foursomes. Ian Poulter, one of the stars of Europe's miracle win at Medinah two years ago, putts on the seventh green on Friday morning. 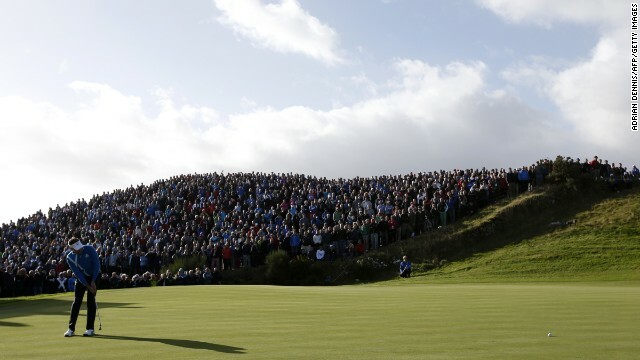 Tens of thousands of spectators are attending the three-day event in Perthshire, Scotland. 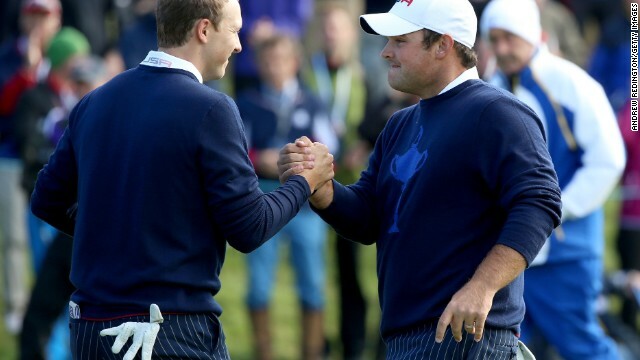 Poulter and partner Stephen Gallacher were unable to contain the U.S. pairing of Jordan Spieth (left) and Patrick Reed who ran out comfortable 5&4 winners, giving Team USA their first point. 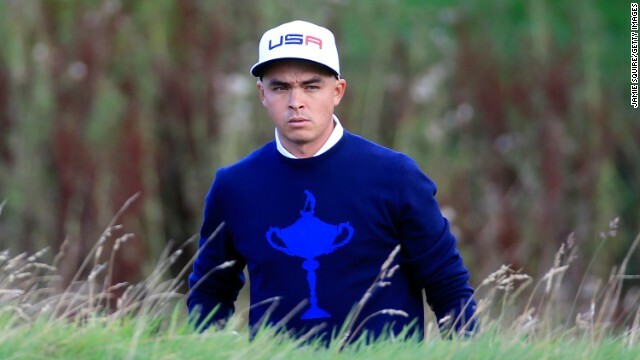 Team USA's Rickie Fowler out on course during Friday's opening fourballs. He and partner Jimmy Walker halved their match with Europe's Thomas Bjorn and Martin Kaymer. The big guns went out last as world No. 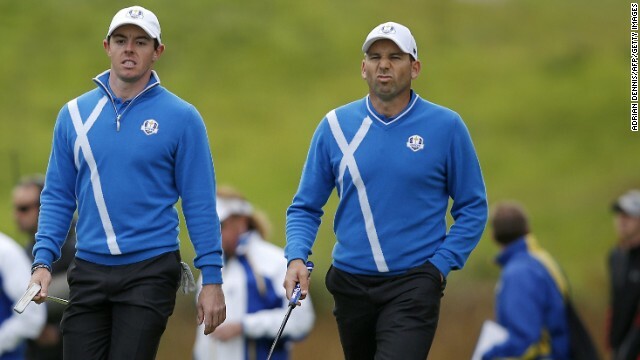 1 Rory McIlroy (left) and Sergio Garcia took on Phil Mickelson and Keegan Bradley in the final fourball of the morning. 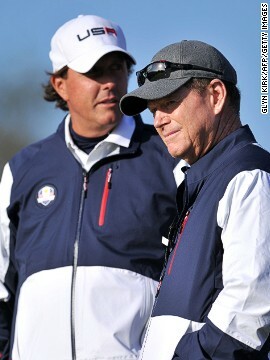 The match went down to the wire with Mickelson (left) giving the U.S. victory on the final hole. 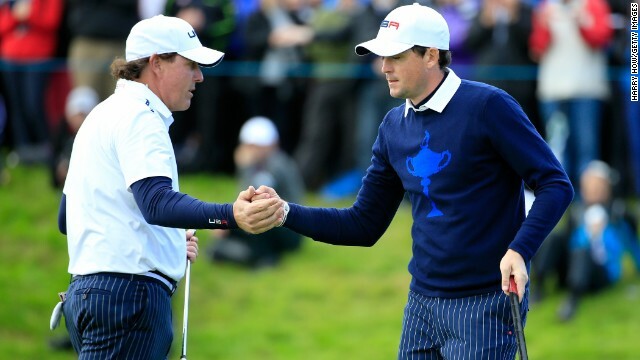 The point gave Team USA a 2½ - 1½ lead heading into the afternoon foursomes. 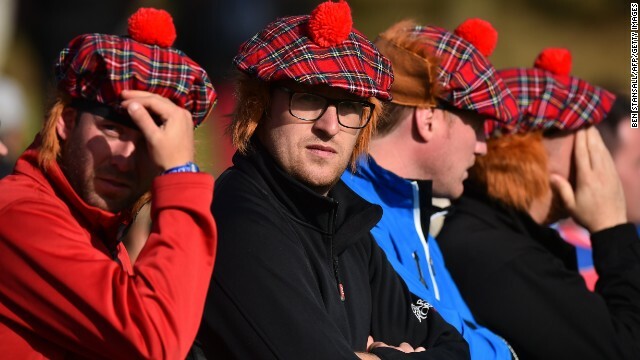 Spectators wearing Tartan caps complete with ginger wigs watch play during day one at Gleneagles. 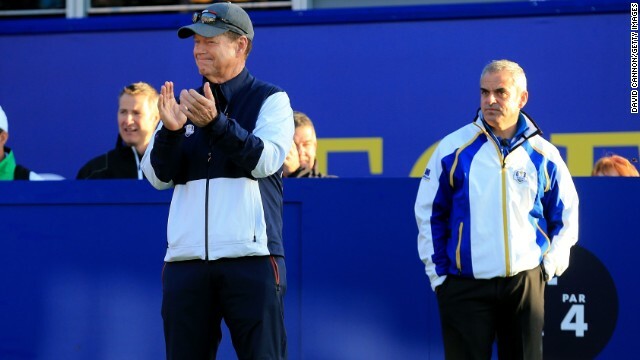 Europe's captain Paul McGinley (right) looks on as Team USA captain Tom Watson applauds the arrival of players onto the first tee. Former player, captain and this year vice-captain Sam Torrance acknowledges the crowd. 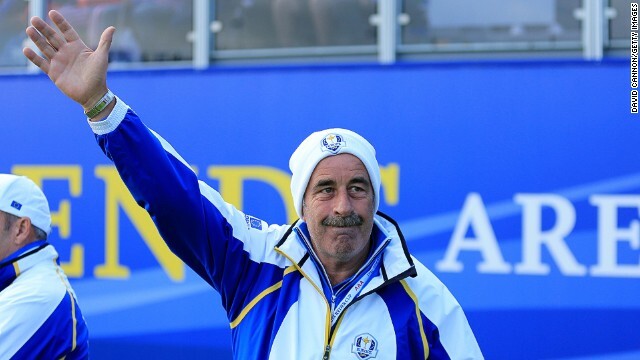 The proud Scot, who holed the winning putt for Europe at The Belfry in 1985, is a massive favorite with the home supporters. England's Lee Westwood (right) and Jamie Donaldson of Wales got Europe off to a perfect start in the foursomes, beating Jim Furyk and Matt Kuchar in the opening match of the afternoon. 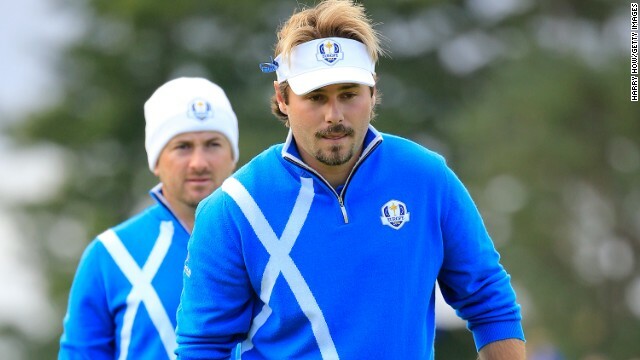 France's Victor Dubuisson (right), who made his debut for Europe in the afternoon foursomes, teamed with Ryder Cup veteran Graeme McDowell. The pair immediately clicked beating Phil Mickelson and Keegan Bradley 3&2 in the final match of the day, handing Europe a 5-3 overnight lead. 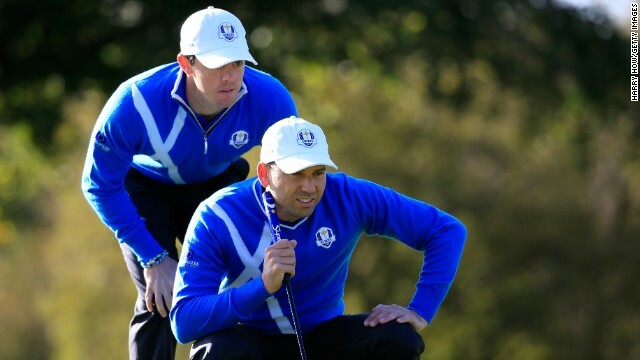 Rory McIlroy (left) and Sergio Garcia banished the disappointment of losing in the morning fourballs with a gutsy performance in the afternoon foursomes. The pair won the final two holes to claim a half against Ricky Fowler and Jimmy Walker. 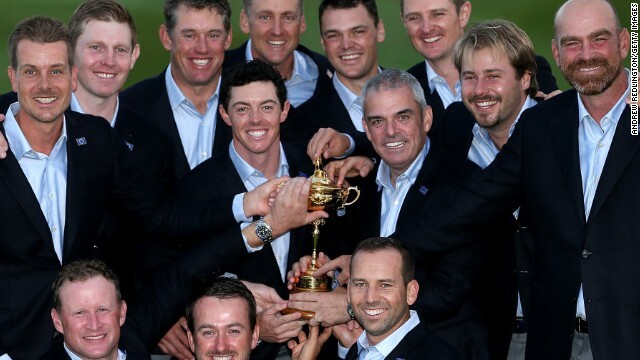 Ryder Cup: One for the future? 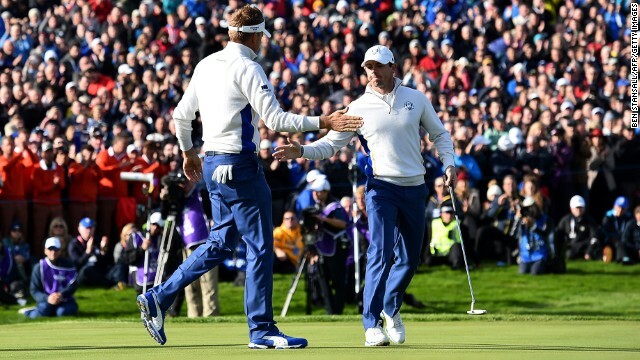 Ryder Cup Day 1: Let battle commence! 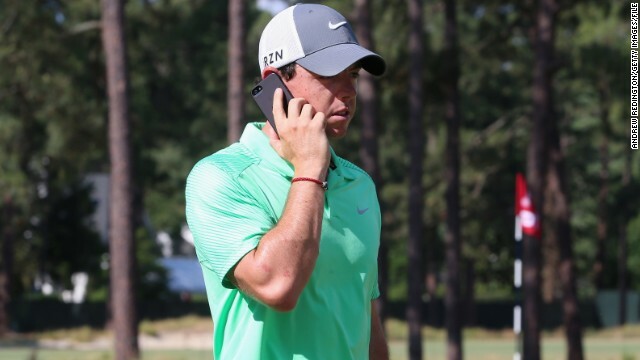 Four-time major winner Rory McIlroy is a big fan of Twitter and regularly posts selfies to his two million followers. 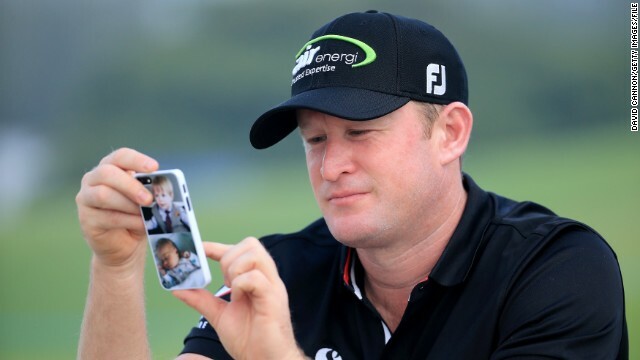 Thanks to the reversing of a ban on uploading photos to social media during the Ryder Cup, golf's world No. 1 can tweet as many selfies as he wants. 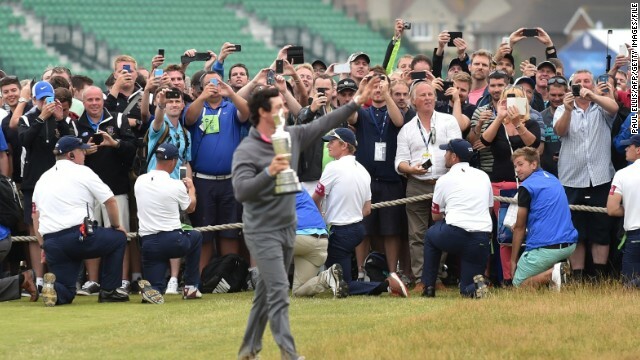 Spectators try to get a snap of McIlroy after his British Open win at Hoylake. 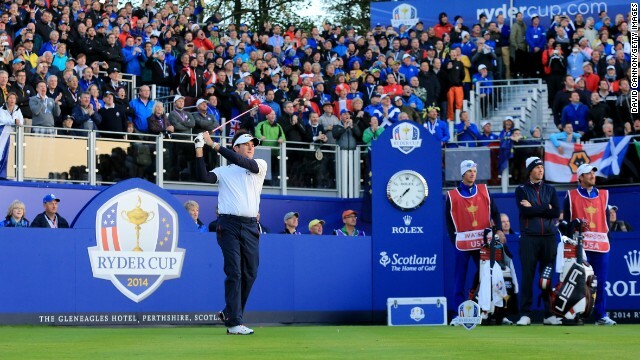 Wifi was available throughout the course for the second year running and will be at the 2014 Ryder Cup in Scotland, with spectators encouraged to share their thoughts and pictures on social media. McIlroy and Sergio Garcia check out something amusing on the Spaniard's mobile phone during a practice day ahead of the 2012 Ryder Cup, won in dramatic fashion by Europe. 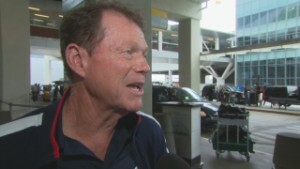 Even United States captain Tom Watson is a mobile phone fan, though he told CNN he can't quite get the hang of Twitter: "I've learned that it's very difficult to tweet. I can't get my fingers to do it fast enough or put the right hashtag -- it's hard to do stuff like that." 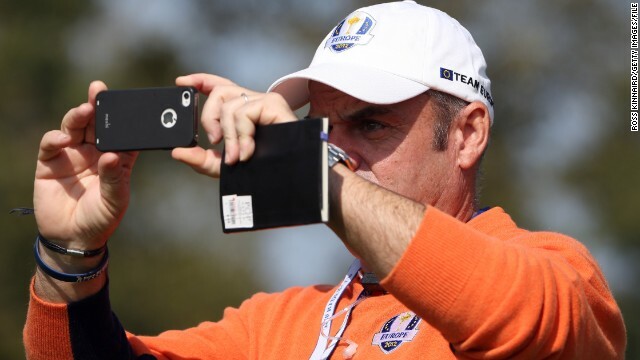 European Ryder Cup captain Paul McGinley also made use of his phone during the 2012 event, in which he was a vice-captain, taking some snaps for posterity. 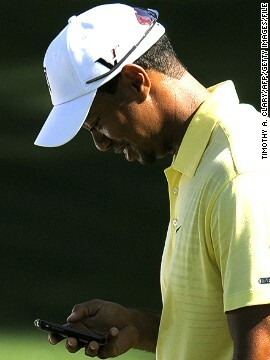 Fourteen-time major winner Tiger Woods checks out his mobile during a practice round, though the former world No. 1 is a sporadic tweeter to his following of over four million. Welsh golfer Jamie Donaldson will play in his first Ryder Cup at Gleneagles. Like many of his European teammates, he often checks in on his mobile. 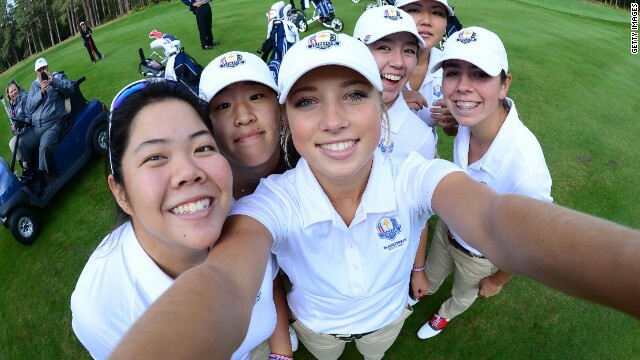 Players at the 2014 Junior Ryder Cup -- which features boys and girls -- got in on the selfie act before their tournament in Scotland. Sierra Brooks of Team USA borrowed a camera to snap her teammates Amy Lee, Andrea Lee, Kristen Gillman, Bethany Wu and Hannah O'Sullivan. 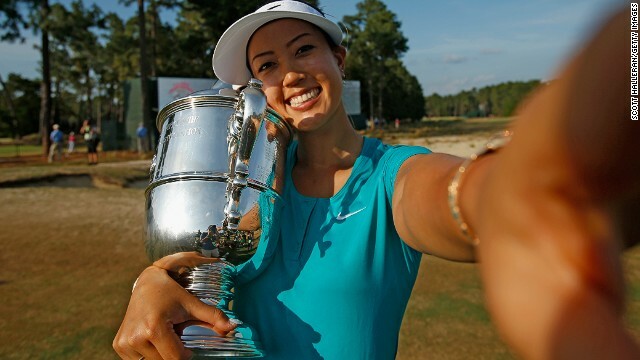 Michelle Wie, who has played in the U.S. Solheim Cup team, takes a selfie after she won her first major title -- the 2014 U.S. Women's Open. "It became more of a relational story than a golf event for me and for our players. Of course they played great but we created the atmosphere and platform for them to play their best. "The code was that Europe had small groups, we went with small groups, that's a Navy Seals philosophy to team building. "To apply those militaristic principles and those business principles to a sporting event and watch it unfold the way it did -- that was the cracking of the code to me." Europe's players were falling over themselves to praise their captain, Paul McGinley, who they said was meticulous in his preparation. Not only did McGinley get to know his players over the course of his captaincy, he also ensured they all felt invested, even detailing one of his five vice-captains to look after those players who weren't selected to play. The Irishman also prepared motivational speeches and videos for his team, even going so far to ensure the goldfish in Europe's team room were blue and gold -- the colors of the continent's flag. McGinley would surely have scored highly in Azinger's recipe for what constitutes a good captain. "A great captain has to be organized," Azinger said. "You have to have the willingness to surround yourself with people that can help you, and you have to make it not about you, you have to make the captaincy about the players around you. "You have to realize you don't get to play but that you have a responsibility and a leadership role of making the guys around you comfortable, confident. "I wanted everyone to have confidence in my confidence in them. And treat them like men, they are professionals. Quote of post-RC: "Right now Europe is the casino and the US is the guy walking to the blackjack table with a fistful of 50s." 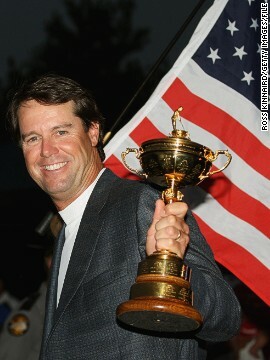 Paul Azinger. "I messaged players according to their personality type, situational messaging -- I didn't give everyone the same message. "You have to build that type of environment and then you have to get out of their way." The calls for Azinger to reprise his role in 2016 began almost as soon as the U.S. defeat was confirmed. Mickelson's praise was followed by a tweet from Jason Dufner, a member of the U.S. team that succumbed to the "Miracle of Medinah" back in 2012, that read"@PaulAzinger #2016." "We all do the best that we can and we're all trying our hardest, and I'm just looking back at what gave us the most success," Mickelson added in his Azinger tribute. "Unfortunately, we have strayed from a winning formula in 2008 for the last three Ryder Cups, and we need to consider maybe getting back to that formula that helped us play our best." Read: Ryder Cup wives "treated like stars"